Set of Mardi Gras style throw beads with football shaped beads. 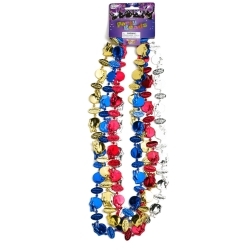 The set includes 4 strands of beads, one of each color blue, gold, red, and silver. These beads are perfect for your next trip to New Orleans for Mardi Gras, your next Mardi Gras themed party, or your next football party.